That’s what my friend complained about the other day. That’s the story, right there. And the recipe, down there. Butter the pan heavily until it resembles a creamy yellow snow scene, then lay all the pretzel logs side by side on the pan. Go ahead and snap them in half, too. Most will already be broken anyway since you accidentally dropped a 20lb bag of sugar on them in the grocery cart; the beauty of this recipe is that you’ll chop them up at the end, too, so no need to be delicate. Hey, you can even toss in other kinds of pretzels as well to fill in all the little gaps. We don’t care. 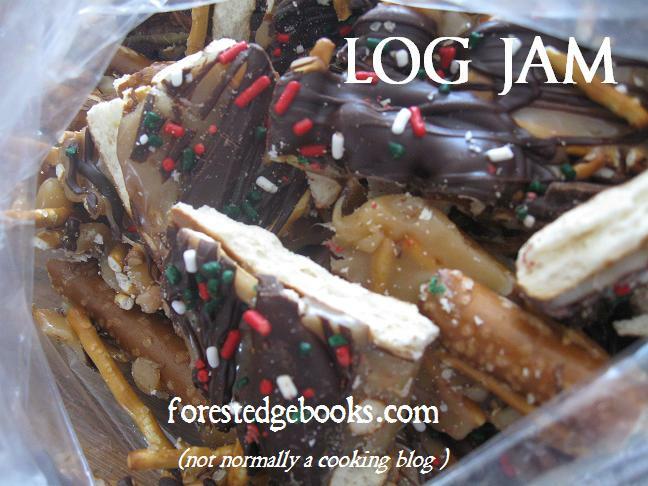 Next, pour HALF of the cooked caramel recipe over the pretzel logs and other stuff you threw in there. 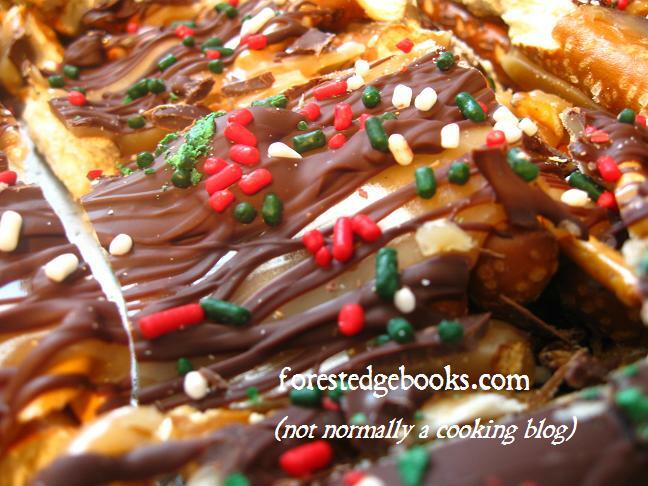 You can try dribbling the caramel artfully, but it’s gonna goo all together anyway, so what’s the point. Pour the remaining half of the caramel into a heavily buttered 8×8″ pan, fully intending to cut and wrap them up prettily in wax paper but knowing full well you’ll stick a spoon in there “just to sample it occasionally” and blame the missing candy on the toddler who can’t defend himself. Next, melt the chocolate chips in a double boiler until just starting to melt. Don’t let it get too hot or it will mysteriously burn and clump together into something no one will want, even if you slip massive chunks of it into cookie dough. If you mess up the first half of the bag, remember, you’ve got the second half, so try the melting process again with the remaining chocolate, but this time slowly, and take it off the heat as soon as half of those chips are melted. They’ll convince the others to join them in the mess in about 3 to 4 minutes if you keep stirring it. What’d I tell you? Artful! 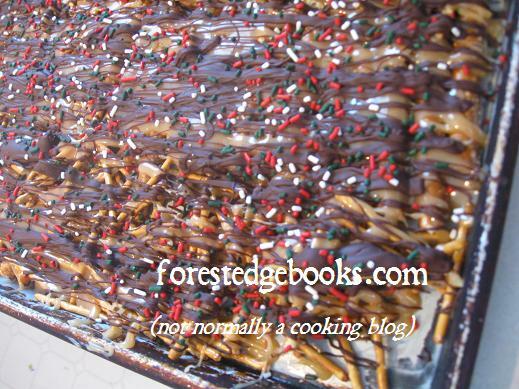 Now, dip a spoon into the melted chocolate and whish-whish-whish it over the caramel layer. Go all in one direction, realizing that the chocolate you fling all over the counter will be licked up later by the cat or your 17-year-old son. This technique will actually make your Log Jam look a bit . . . artful! I’m not really sure how long it stores, because it shockingly doesn’t last until morning (but my stomach ache sure does). Makes enough to feed your family, the in-laws, and maybe a few neighbors. All right, friend–you know who you are. Here’s your recipe, now start reading!